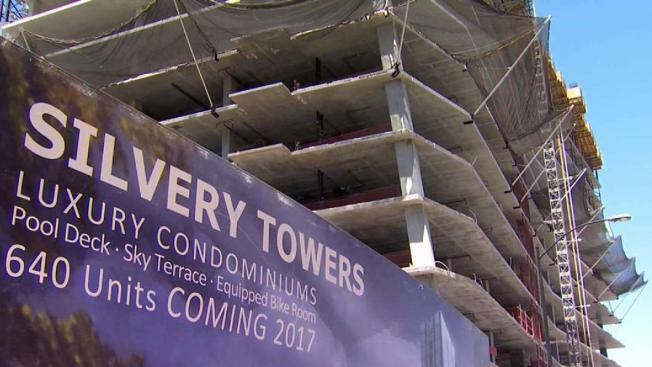 The construction boom in San Jose is a boon for developers but many South Bay workers say they're being left out of the prosperity. On Wednesday, some of those workers laid down their tools to carry picket signs in a protest against developers who don't hire local laborers. Labor groups, joined by community activists, say all the building taking place in downtown San Jose and other parts of the South Bay, is happening at the expense of local workers. The picketers marched in front of what they called a "non-worksite," where a banner depicted a luxury condominium high-rise called the Silvery Towers. The development is a privately funded project on private property, which means the developer is free to hire workers from any area and not have to pay the local prevailing wage. "They'd rather bring in people from out of the area and pay them substandard wages to come here and develop their project," electrician Will Smith said. "And all these people are going to do is take their money and go back home." Labor groups on hand such as the South Bay Labor Council announced they were planning a ballot initiative that would require South Bay commercial and residential developers to hire local workers and pay them what they called a "family sustainable wage." The group is pointing to a poll by EMC Research, which it paid for, that shows 76 percent of South Bay voters side with the local laborers. "We are not going to be afraid to confront the powerful when they hoard wealth for themselves and do not share in the prosperity," said Derecka Mehrens, CEO of Working Partnerships USA. The coalition said it is now drafting the initiative before it begins gathering the 22,277 signatures needed. But San Jose Mayor Sam Liccardo said requiring developers to use local workers and pay prevailing wages on private projects could be complicated. "The problem is the devil is in the details, and we don't know what those details are," Liccardo said. "We want to be able to study them and understand how they impact housing affordability and comparable issues." Project officials at the protest site had no comment on the issue. In the past, developers have said a local-hire policy would increase costs and make it difficult to find enough skilled workers.